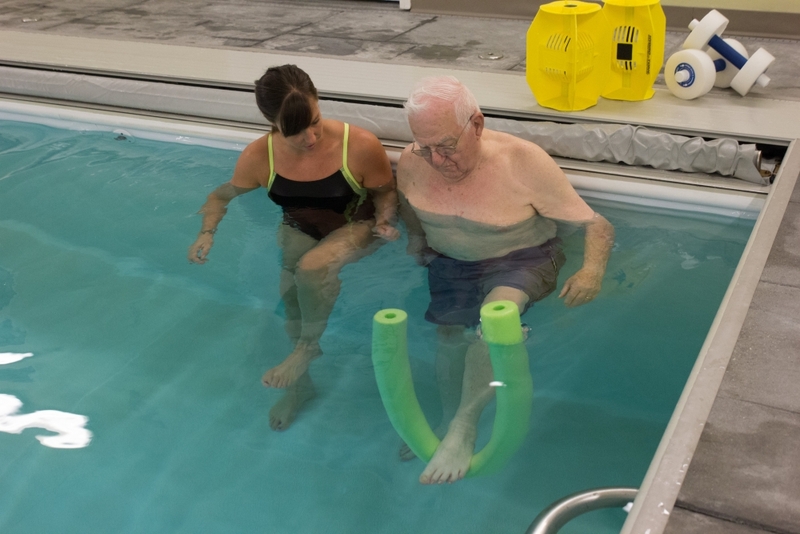 Exercise and movement in water offers a unique approach to rehabilitation. There are unseen forces in this environment that support your body and facilitate movements that may be difficult for you on land. It helps to improve flexibility, strength, and stamina and it is unparalleled in addressing balance issues. 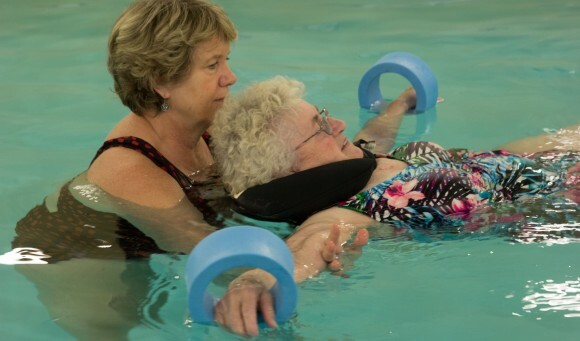 Aquatic therapy is the best holistic approach to improving your function because it addresses the whole body at once and it can be easily continued on your own after finishing with physical therapy to maintain long term fitness. 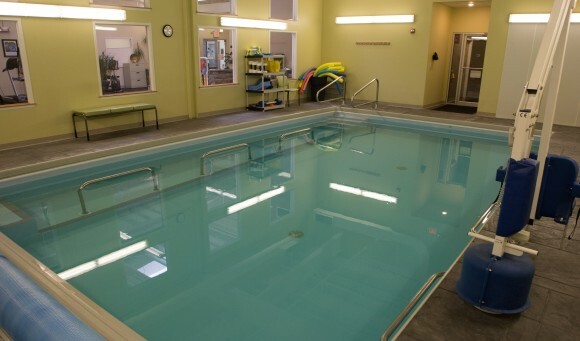 Our salt water therapy pool helps to reduce your pain and improve your ability to move in a different manner than traditional therapies because of the buoyancy, hydrostatic pressure, and heat. 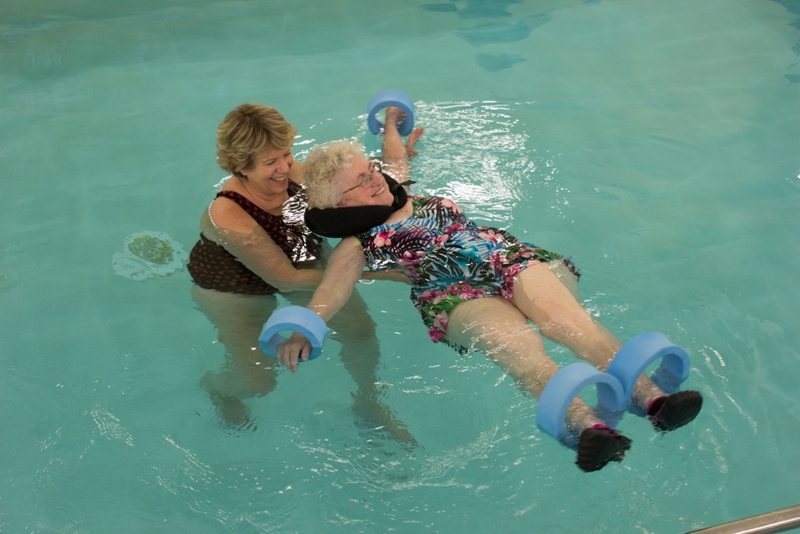 Buoyancy is the upward force of the water that reduces the pressure on all of your joints. Buoyancy can make certain movements easier to do and allows you to stretch your tissues further than if you were on land. 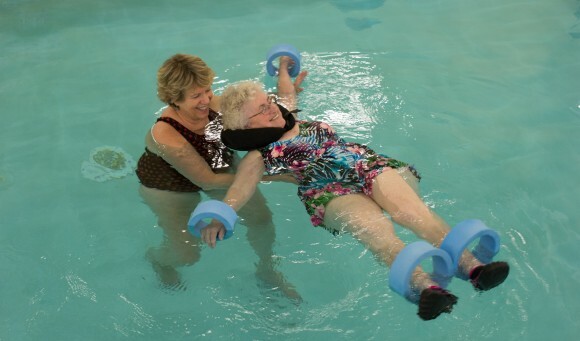 The buoyancy also provides support to allow you to work on your balance without fear of falling. Salt water is more buoyant and therefore provides more benefit than a traditional pool. Hydrostatic pressure is the pressure that water exerts on your body, which provides more resistance to movement and gives you feedback on how you are moving. It allows you to coordinate movements more easily to develop proper patterns with walking, squatting, stepping, and other daily movements. 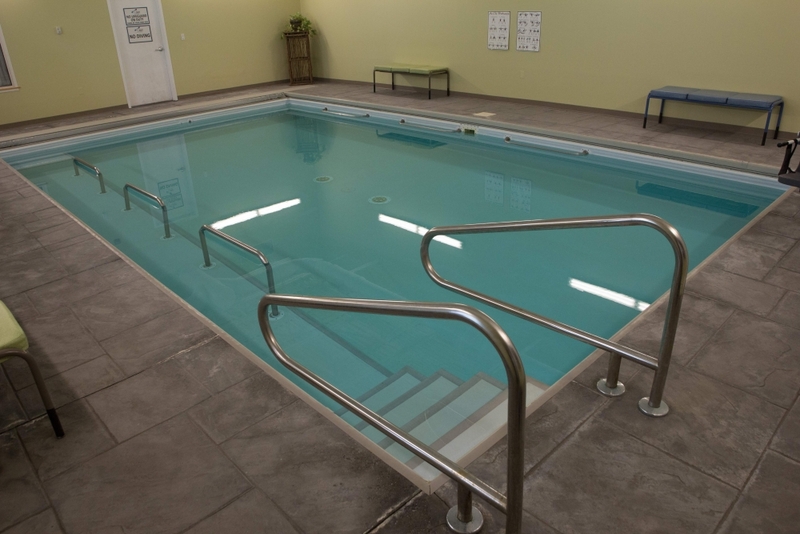 The heat of our pool is kept at 92-93° F to help your tight tissues to relax as you exercise because it is closer to your internal body temperature. Relaxing these tight tissues improves your flexibility and decreases pain. Our pool is 4' deep with a 3’ runway section along one side and bars along both sides so you can comfortably exercise in different depths. 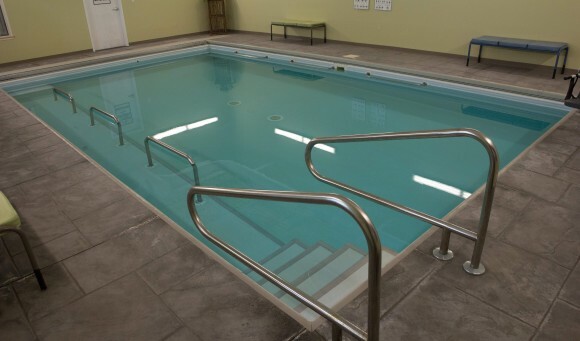 It is accessible with a set of stairs and with a poolside lift if you are unable to use the stairs. 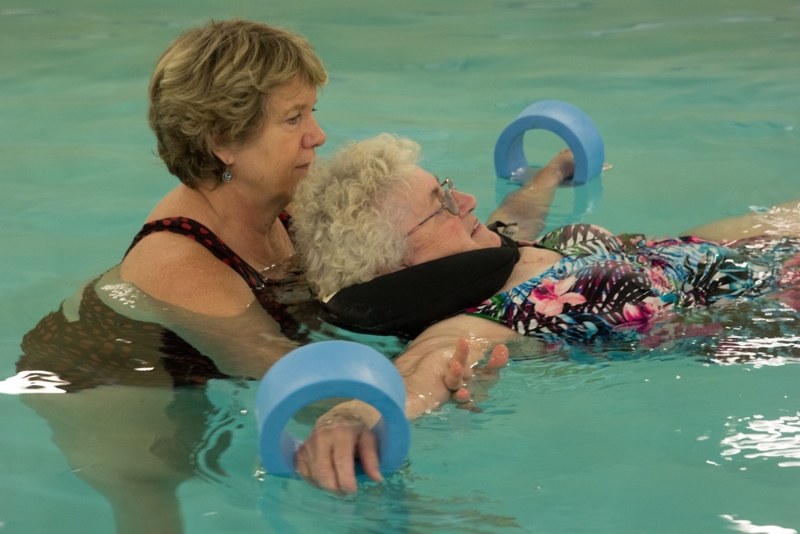 If needed, our therapists will join you in the water for safety and support while you exercise. Your therapist will develop an exercise routine as part of your therapy program. 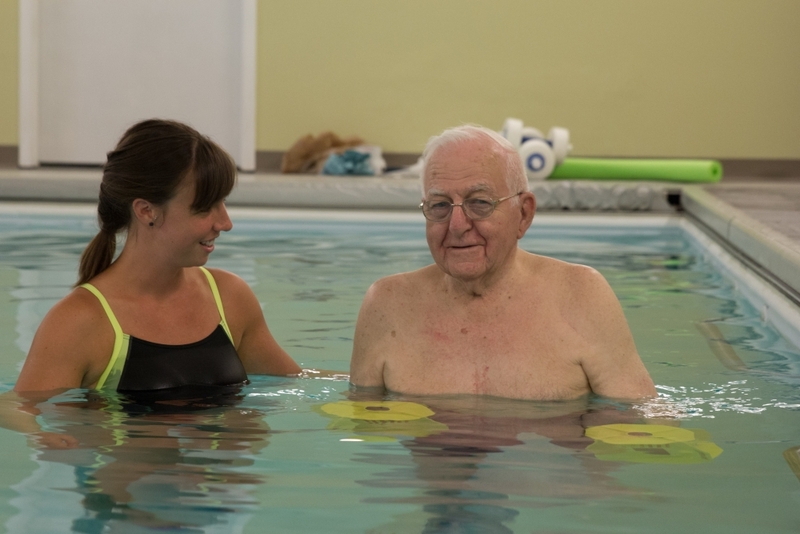 Depending on your physical needs, aquatic therapy may be the primary resource for your rehab or a stepping stone to a land-based program. 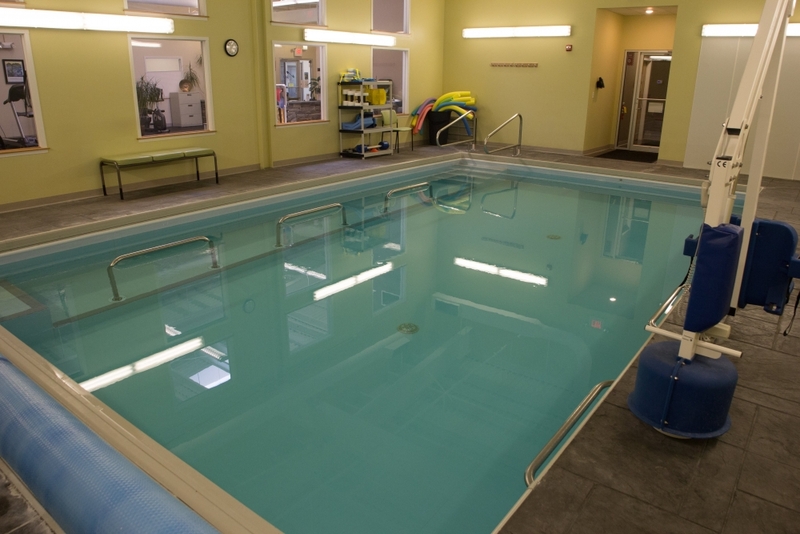 The role of aquatic therapy in your rehab will be discussed at your first visit. You will receive your personalized program when you are ready to continue on your own. You may experience fatigue, sleepiness, and/or soreness following your first few sessions. This is due to changes your body experiences in the pool with the relative relaxation and increased use of those muscles. Drink lots of water to remain well hydrated and get the rest your body demands to fully recover. As always, talk with your therapist if you have any questions or concerns. Please bring a swimsuit, towel, shoes to wear between the pool & locker rooms, and personal care items for showering after your session. Don't forget extra clothes if you decide to wear your suit to the office. A lock to secure your personal items is a good idea.